Nikon has just release a short video focusing on various elements of its upcoming full-frame mirrorless camera. The teaser trailer doesn't give too much away but it certainly has us excited ahead of launch event happening on 23rd August 2018. The video is a littler over 30 seconds, and features famous film and digital F-mount cameras. The video then fades to black, and begins shows a darkened shot of Nikon's new mirrorless camera. You can clearly see the Nikon logo on the raised viewfinder mount, and you can see a lens on the front of the camera, rather than the exposed lens mount. The video is accompanied by a caption saying "We’ve pursued the development of the ultimate camera for many years. Our new mirrorless system further embodies our spirit of manufacturing cameras without compromise." 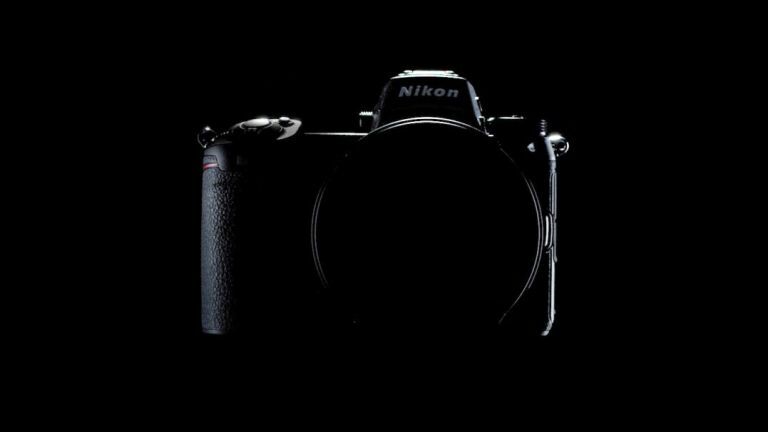 The video was released on Nikon's official mirrorless website (as well as YouTube), along with a new still image of the new camera. This very dark image doesn't give much away, but our sister site TechRadar tweaked the levels in Photoshop to reveal a mode dial with settings for Manual, Aperture and Shutter priority. You can also make out the hot shoe mount, and what appears to be a very faint outline of a top-plate LCD display. Looking at the lens we can see what appears to be a 70 figure on the barrel, suggesting a 24-70mm kit lens is being launched with the camera.